We'll walk you through your first 30 minutes or so with Windows 10. Windows 10 is here! Windows 10 is here! Now what? 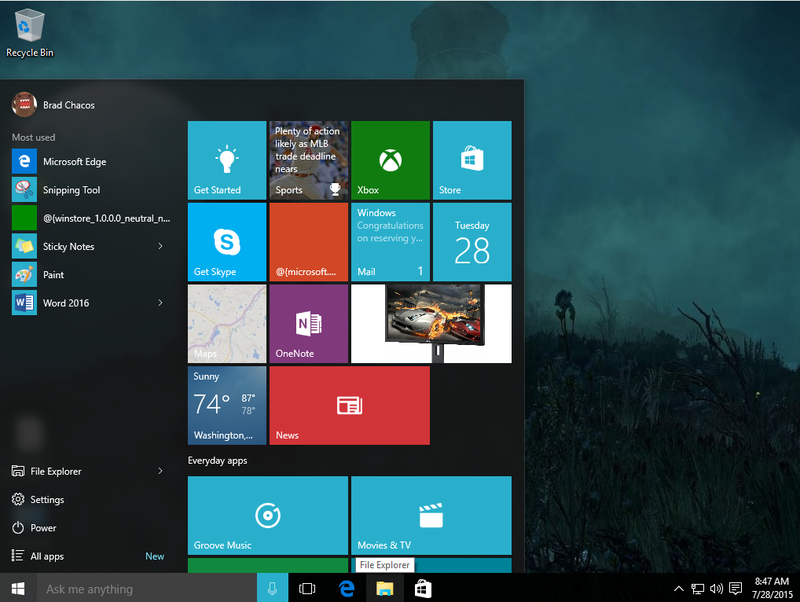 By now, you’ve seen our review of Windows 10. It’s one of the best operating systems Microsoft has ever produced, and it’s worth the download. But if you’re new to Windows 10, it can feel a bit daunting. Actually, it’s more familiar than you think. And we can help walk you through your first 30 minutes with Windows 10. If you purchased a new Windows 10 PC, you have the easiest road. You can skip this section. But for most of us, Windows 10 came via an upgrade to Windows 7 or Windows 8.1. And if you’re in the camp, read on. Also see: PCWorld's detailed walkthrough of how to install Windows 10. Assuming you reserved Windows 10, you could see Windows 10 start showing up tonight. If you don’t, that’s a.) either because Microsoft has millions of PCs to upgrade, and you’re further back in the queue or b.) because you’re missing a critical driver. If you have a piece of hardware that lacks a signed, approved Windows 10 driver, Microsoft won’t deliver Windows 10 until you do. Makes sense, doesn’t it? On the other hand, some of you may be surprised just by how quickly Windows 10 showed up. That’s because Microsoft quietly preloaded Windows 10 onto your machines, then unlocked the code beginning at midnight Eastern. After that, Windows began its installation. Once Windows 10 passes the magic hour, you should see the installation process begin. Microsoft will install the files, ask you for your Microsoft account, and unlock Windows 10. Those files will be downloaded to your PC, part of what's called an "update in place". Windows 10 will be overwritten onto your PC. But you'll also have the option to create a USB key or other installation media to do a "clean install," which enthusiasts prefer. The Windows 10 installation tool. 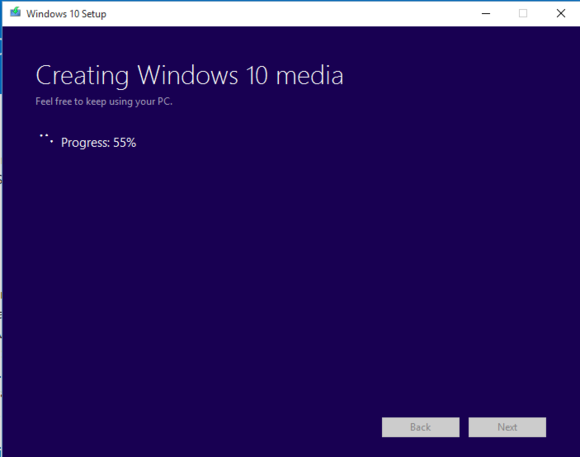 To do so, you can download the Windows 10 media here, which will allow you either to create an ISO file that you can burn to a DVD, or else create a bootable flash drive. You'll have the option of installing over an existing Windows installation, or starting from scratch. Our guide to installing Windows 10 can help walk you through the process. I know the first thing you probably want to do is explore your new operating system, but let’s put that on hold for a second. We’ve been told to expect a pretty massive “Day 0” patch from Microsoft, which you may have received as part of the upgrade/setup process. Let’s just make sure that isn’t anything more in the pipeline. Don’t be disappointed, however—we can still continue with your Windows 10 orientation. We’ll just have an overarching goal in mind. And fittingly, the place to start is, well, Start. All the way down in the left-hand corner of your screen is the Windows icon—probably similar if not identical to the Windows icon on your keyboard. If you click on that icon, tap that icon on your touchscreen, or touch the Windows key on your keyboard, you’ll open up the Start menu. The Windows 10 Start screen. Boom! Pretty nice, right? Windows 7 users, you’re going to see a list of apps listed in the left-hand nav bar. Windows 8 users, you’ll notice the familiar Live Tiles to the right. Some of those Live Tiles may already be flipping over to show you relevant information. For now, though, let’s start on the left. What you’ll see is a list of “frequently-used applications” that Microsoft has selected for you—they may have even carried over from a previous OS, if you upgraded Windows 10 in place. These will change depending on how frequently you use them. Unfortunately, you can’t pick and choose what apps appear here. You can make some adjustments, however, and we’ll show you how in a second. Here’s a hint: it’s in that “Settings” link, at the bottom. Take a minute to click the “All Apps” button at the bottom of the list. This should be called the “Almost All Apps” button, because Windows, inexplicably, doesn’t show you tried and true apps like Paint where you might expect them. But everything else that’s installed on your system should be there. For now, let’s look to the right. The first thing you should know is that the Start menu is a window—it can be resized and reshaped to your preferences, within limits. It can even go full-screen, although that will require a change in the Settings. 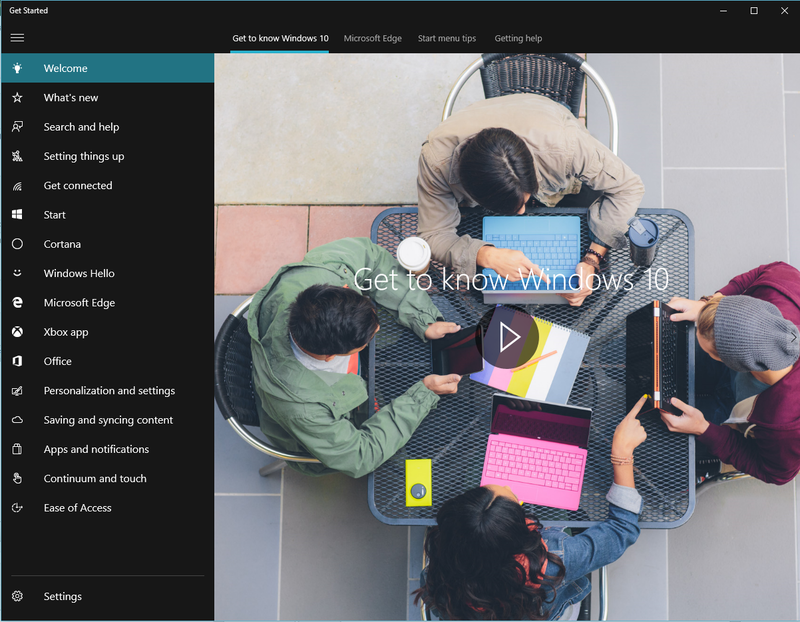 Windows 10's Get Started app -- a good resource if you're looking for some more hand-holding. You can arrange and rearrange tiles as you’d like. Try right-clicking on one, and adjusting the size; if you can’t enlarge it, try dragging-and-dropping it to an open space. Maybe you’d like the Mail application to be in the top left-hand corner. Or your Calendar. 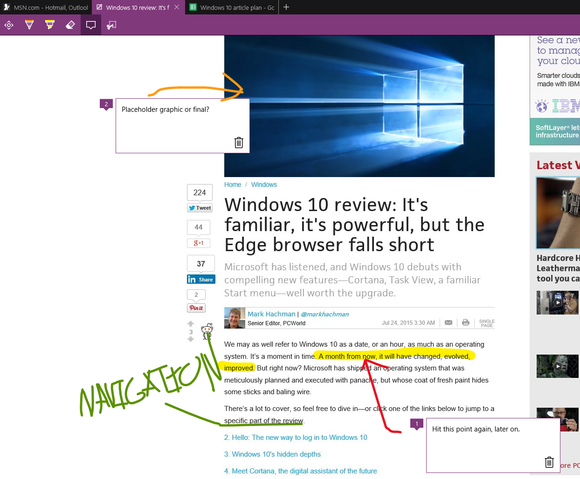 You should be able to pin any app to your Start menu, including those found in the left-hand nav bar. Not all will function as Live Tiles, however—that’s up to the app designers. There’s one app I want you to look out for: Get Started. It doesn’t appear that Microsoft is going to hold your hand through the opening minutes of Windows 10, so Get Started is Microsoft’s overview to the new OS. You don’t have to click it now, but be aware it’s there. Now, scroll down to Settings, and click there. Some people get a little nervous about tampering with the guts of their PC. Don’t worry—the real guts of the PC are left for the Control Panel. In Windows 10, Settings are more like your car’s dashboard. Check this to make sure you have the latest updates. Remember, we want to find out how to check for updates. And this we can do, quickly, by going to the search box in the upper right. Just start typing “Update” and a number of options should begin appearing. We want “Windows Update settings”. Click that. 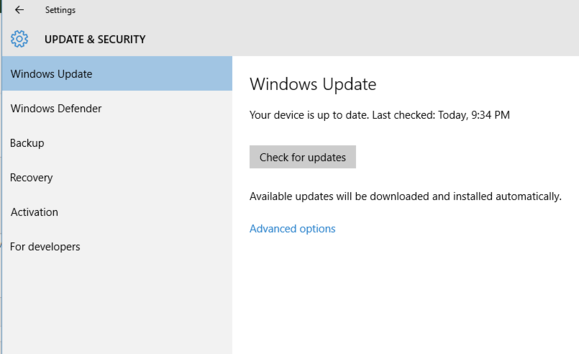 On the following screen, click “check for updates”. If your system begins downloading updates, grab a cup of coffee and check back in a bit. Once that’s finished, great! You’re up to date and ready to go. Now, let’s continue making your PC yours. Click the gear icon at the top-left corner of the window until you’re back at the main Settings page. Where we’re headed now is the “Personalization” icon. Windows 10 smartly makes the background screen the first Personalization setting to be adjusted. These should be self-explanatory: pick a background screen or stick with the default. If you want to load a picture of your kids, for example, you’ll need to track one down from Facebook or elsewhere, or use one that’s stored on a USB key or in the cloud. Flip through the other settings on the page, using the left-hand navigation bar to tweak various elements of your PC. On the lock screen setting, for example, you’ll have the opportunity for Windows to show you your next appointment, for example, if you set up Calendar to show a detailed view. By the time you’re done, your Windows 10 PC should look and feel more like home. And if your Windows 10 PC now feels like home, Microsoft would like for you to start thinking of Cortana as one of your friends. If you’re familiar with Windows Phones, you’ve probably heard of Cortana: a digital assistant who can answer questions, set reminders, keep an eye on packages sent to you, and more. Right now, she’s probably down in the lower-left hand part of the screen, asking you to “Ask me anything”. 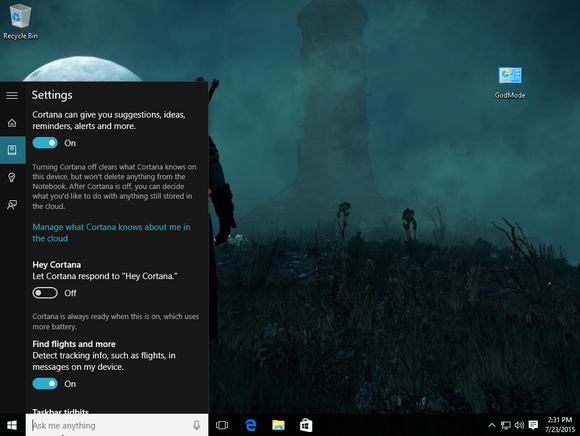 By now, you may have seen our detailed guide to Cortana, and I’d encourage you to read it. But let’s briefly run through the basics. 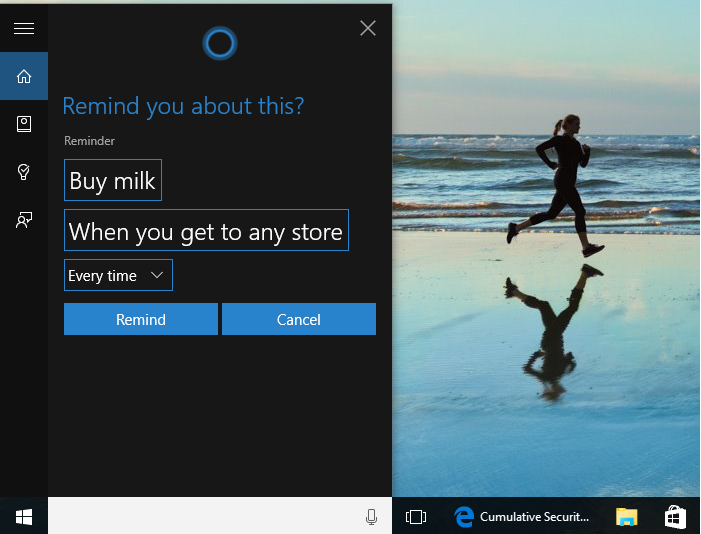 Use Cortana to set reminders and ask about facts. You don’t need to use Cortana, although the first time you click on the search bar you’ll receive a pitch to set Cortana up. Cortana wants to pry into as many corners of your digital life as you’ll allow in order to work best. If you agree, she’ll start working in the background to advise you, for example, of when you’ll need to leave to make your dentist appointment on time. If you don’t want to use Cortana, you can opt out—in the initial stages, or later, via the Cortana settings menu. You’ll need to enter the Notebook to do that: click the search button, then the third icon down from the left. Go to the Settings menu and you’ll see a toggle switch to turn Cortana off. Once back in the Notebook, you can also dig through the various categories and let Cortana know your likes and dislikes, too. Hey Cortana! You don't need to type; Cortana can listen for the sound of your voice. If you do set a reminder, it will pop in from the lower right, and usually squat down in the corner of your screen until you dismiss it. Mail notifications work a bit differently; they’ll fly in, hover for a moment, then disappear. Miss something? Well, there’s an archive of what Windows 10 showed you, called the Action Center, waiting patiently in the system tray portion of your taskbar, in the right-hand corner of your screen. It looks like a text bubble from a comic book. Click it, and you’ll see a summary of what Windows 10 thought was important. Cortana can serve as a generic search bar for documents and other apps you’ve stored on your PC. Sometimes, the easiest way to launch an app is simply to start typing its name in the Cortana search bar. There are three more things that you need to be familiar with before our tour is done: launching the Internet browser, Microsoft Edge; setting up your email; and downloading just a few of the apps that you’ll probably want from the Store. The one question some of you are undoubtedly asking is: “How do I get to the Internet? !” That’s an easy one: with Microsoft Edge. You’re probably familiar with the Internet Explorer logo. Edge, not coincidentally, looks like an, er, edgier version of Internet Explorer. The easiest place to find it is down at the bottom of the screen, in the row of icons that Microsoft calls the “toolbar” but you probably know as the taskbar. Click it. Edge will probably launch with an array of content from across Microsoft’s properties, with a search bar in the middle of it. Like most modern browsers, you can either type a Web address or a search term in the field. You can use Web Notes to mark up all sorts of Web pages, for all sorts of purposes. Again, however, you’ll want to explore the settings. This time they’re hidden inside an ellipsis (...) menu to the upper right (hurray for consistency, Microsoft). The first thing you may want to do is change the “theme” from light to dark, just to see the difference. Next, you’ll want to import your favorites from another browser. This can be a bit tricky. If you’re a Chrome user, you’ll probably want to simply search for Google’s browser, download it, and then decide whether or not you’ll want to take your bookmarks and import them to Edge. Ditto for Mozilla or Opera. If you worked in Internet Explorer, however, your bookmarks should carry over. 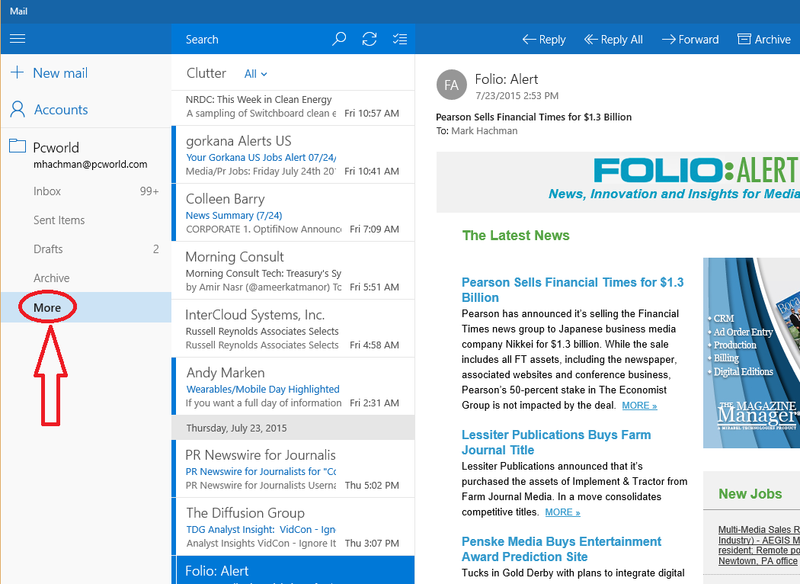 Honestly, setting up email within Microsoft’s Mail app couldn’t be easier. Launch it (either via the Start menu or via Cortana) and then simply add an account. You’ll need to type in your email address and password, but after that you should find Mail reaches out and grabs what it needs. If you’d like, you can even add multiple accounts and switch back and forth. Clutter is a nifty feature of Mail. Here's where you'll find it. About the only tip I’d recommend is clicking the “More” link in the left-hand list of links. That opens up a number of different folders in which to store your email, as well as the Clutter folder, which is Microsoft’s modern equivalent of the Spam folder, hiding emails that aren't quite junk, but aren't important, either. You may also want to explore the Settings menu (in this app, it’s a gear icon in the bottom left corner). Last but not least, you’ll want to grab a copy of Microsoft Office. You have two options: pay for a full-fledged copy of Office 365—which will require you to pay $70 per year for Office Personal—or the much simpler, cheaper route: Word Mobile, Excel Mobile, and PowerPoint Mobile. All three are free, and available via the Store app. 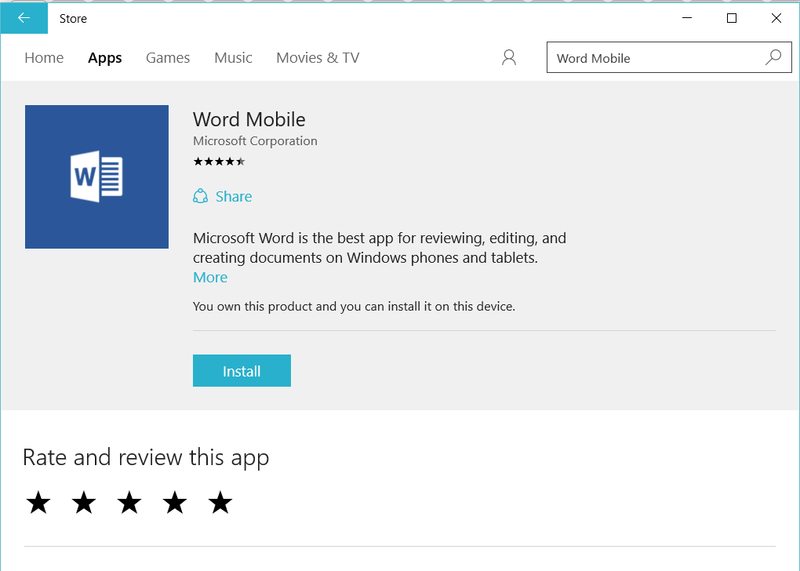 It's a mystery why Word Mobile isn't heavily promoted in the Store app. Microsoft’s Store is a home for, quite frankly, a lot of mediocre apps that you don’t need. What you should do, however, is type “Word Mobile” into the search bar, download it, an do the same for the other two apps. Word Mobile doesn’t have all the features of Office 365, but it has enough to satisfy the casual user. That’s it! Please feel free to wander through the rest of Windows 10. If you need more assistance, check out PCWorld's guides to the 10 best new Windows 10 features to try first and the handiest, dandiest Windows 10 tips and tricks. And for the latest on Windows 10 news, tips, and tricks, keep refreshing PCWorld. Updated at 12:21 PM on July 29 to clarify some language. Thanks, grcooper2!